Used medicinally for over 2,000 years, silver was known for its anti-microbial and wound healing properties. As a natural element believed to enhance the immune system and support the body’s own innate healing processes, silver was widely used before the advent of antibiotics. Natural Immunogenics Corporation provides very high quality, pH neutral, biologically active silver hydrosol products with positively charged silver ions and silver nanoparticles for easy absorption and elimination. Their expert team includes experienced scientists and medical doctors who remain focused in the area of colloidal chemistry. Manufactured in their own state of the art facility, Natural Immunogenics is certified by the NSF-International under Good Manufacturing Practices (GMP). Natural Immunogenics is committed to maintaining the highest degree of regulatory compliance, including those established by the Food and Drug Administration (FDA), the U.S. Department of Agriculture (USDA) and the Federal Trade Commission (FTC). The safety of Natural Immunogenics’ silver hydrosol products is determined by independent third party testing assuring quality, purity, identity, composition and strength. Dosage amounts for health purposes were established by the Environmental Protection Agency over a 70 year study. 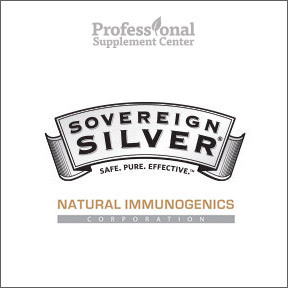 Now available at Professional Supplement Center – Natural Immunogenics Sovereign Silver® retail line containing 10 ppm and Argentyn 23® professional line containing 23 ppm. available solely through healthcare practitioners. Sovereign Silver® First Aid Gel – 20% OFF! This 99.99% pure, actively charged homeopathic remedy provides healing relief for symptoms of pain and swelling due to minor wounds, burns, bruises, bug bites, minor skin infections and rashes. Allergen, gluten, soy, dairy, sugar and GMO free, vegan formula. Sovereign Silver® Bio-Active Silver Hydrosol™ 10 ppm – 10% OFF! This easily absorbed, positively charged colloidal silver contains 99.99% pure silver and pharmaceutical-grade purified water in support of immune health. Allergen, gluten, dairy, soy, sugar and GMO free, vegan formula. Argentyn 23® Fine Mist Spray – 10% OFF! This professional grade, evidence supported, bioactive silver hydrosol spray aids in supporting short and long term immune health. Available solely through healthcare practitioners, Argentyn 23® contains no additives, salts or stabilizers, just 99.99% pure silver suspended in pharmaceutical-grade purified water. Gluten, allergen and GMO free, vegan formula. Argentyn 23® Liquid – 10% OFF! Formulated to be taken orally to support short and long term immune health, Argentyn 23® contains easily absorbed, positively charged, ultra-small particle size colloidal silver. Argentyn 23® contains no additives, salts or stabilizers, just 99.99% pure silver suspended in pharmaceutical-grade purified water. Gluten, allergen and GMO free, vegan formula. This entry was posted in Home and tagged Argentyn 23® Fine Mist Spray, Argentyn 23® Liquid, Natural Immunogenics, Sovereign Silver, Sovereign Silver® Bio-Active Silver Hydrosol, Sovereign Silver® First Aid Gel. Bookmark the permalink.